Staff at a National Trust property in Cornwall say they are overjoyed after discovering a dormouse in a nesting box at the site. Staff at Lanhydrock were becoming increasingly concerned that their regular dormouse surveys were yielding no results. 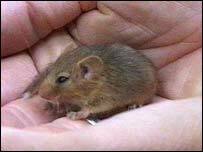 The first dormouse was found on the estate in 2002 and the first breeding pair successfully raised four young. But no dormice had been found in the past 18 months. Lanhydrock joined English Nature's National Nest Box Survey in 2001, to discover if any dormice were living on the estate and staff from the Trust put up 25 purpose-built nesting boxes. Matt Lewis, National Trust Area Warden for Lanhydrock said: "The dormouse that we discovered was a very young male and most probably from a second litter. "We are over the moon, because this has confirmed what we had been hoping, that the dormice are still on the estate, but just very elusive." Dormice are mainly nocturnal and spend five to six months of the year hibernating.